A Tangy dessert based on the tangy lemon! Baking tin, 30cmx30cm (12”x12”), lined with butter paper. A towel or some other piece of cloth, a little larger than the tin. Make the Lemon Curd : Place the sugar, butter, lemon rind and juice in a pan and place the pan in another pan with hot water in it (or use a double boiler). Stir, till sugar dissolves. Add the eggs gradually to the mixture, stirring all the time. Continue to cook, taking care not to let the water come to a boil (or else the eggs may curdle). Cook till a coating consistency is reached. Takes about 15 minutes. Remove from heat and use or cool and store in sterilized, air- tight jars. Note: The broader the vessel the faster it will cook, since a larger surface comes in contact with the heat. Sprinkle icing sugar over the towel and keep ready while cake is baking. Remove cake from oven and turn it over on to the towel, top side down. Trim off the edges immediately and roll cake into a scroll, along with the cloth, and leave to cool. When cool, unroll the cake and remove the butter paper, and spread a layer of lemon curd over it. 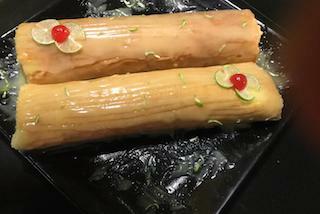 Re-roll, leaving the cloth behind, and arrange on to a serving dish, with the edge on the bottom and cover with a layer of lemon curd and serve.